My friends called me “Feliz.” I love traveling, taking pictures and eating. I already have a B.A. degree from Thailand and I worked at the JW Marriott Phuket, Thailand for about 3 years. I decided to come to America to improve my English and to learn more about the American culture. I’m currently enrolled in the Business Administration certification program because I believe this will guide me to know more about business and accounting which I will use to get a better job in Thailand. I have also been taking ESL classes since last summer. I decided to attend Seattle Central because it has a program that matches my goal and is in a great location. It is very convenient to get to school by bus since I don’t drive. The International staff is very kind and friendly and I really appreciated their help while I was working on my visa. I was an Au pair before I decided to continue my education in the USA and my host family gave me a recommendation about this college. They were also very supportive of the idea so I did it. Seattle Central has the benefit that it is easy to reach from my host family’s house in Magnolia because it just takes 20 minutes by bus. I have been enjoying Seattle Central so far. The faculty have a lot of experience teaching international students so I feel very comfortable being in class with students from around the world. The instructors teach me to be confident in class. I can ask questions in class if I don’t understand a lesson or email the instructor. They make sure that students learn and develop themselves to be ready to take college classes. I really enjoy studying and meeting new friends. There are many organizations and events that we can join. Seattle Central also provided a special scholarship to some students who were financially affected by the flooding in my home city of Bangkok. I cannot explain how much I appreciate this assistance from Seattle Central. There are many things that are different from our country such as hugging each other. We don’t hug everyone likes Americans do. In the beginning I was nervous when people gave me a hug because I didn’t feel comfortable and I thought it’s not so good to hug someone we don’t really know especially a person of the opposite gender. Later, I learned that hugging is a nice custom. We share our love and care from hugging. When I feel lonely and home sick, my friends always cheer me up and they give me a hug to make me feel better. I am not afraid anymore to give my friends a hug because I know how hugs give me a great opportunity to transfer my feelings to friends and family. I plan to attend graduate school somewhere in America (hopefully in Seattle.) It depends on how well I do on the GMAT and TOEFL test. I have studied hard in class and also do activities outside of class. I have learned that I cannot just study while I’m in America because it’s a great opportunity to be here and I don’t know when I will have a chance to come to the U.S. again. The classes are very helpful; I am improving my English and gaining more knowledge in the business field at the same time. I have developed myself and am ready to be a good worker in the future. I have learned to be happy in America and enjoy being a part of American society. Studying abroad has changed my life a lot. I used to be an unconfident person but now I have more confidence. My life is getting better in a positive way. I know how to enjoy life. I learn to love my life more. I can’t imagine if I decided not to come to America. The most important thing is I love my family more than ever! We don’t know how much we miss home and how much “Home” means to us until we are away. Seattle is a great city with many activities that I like to do. My favorite thing is to travel around the Seattle area. I love taking pictures so I like to make trips to different places. I especially love dining out, trying new foods and finding the best Thai restaurant in Seattle. 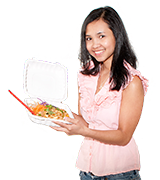 There are more than 600 Thai restaurants in Seattle, so you don’t need to worry that you will miss Thai food. I’m very happy that Seattle has a lot of great places for me to explore. I can go to the beaches, mountain, or do some sightseeing around the town. I can also take a bus, a taxi, or a ferry to get to all these places.